North Korean leader Kim Jong-un has climbed Mount Paektu, the country’s highest mountain, KCNA reported. Photos of Kim Jong-un show him standing on a snowy mountaintop, with the sun behind him. 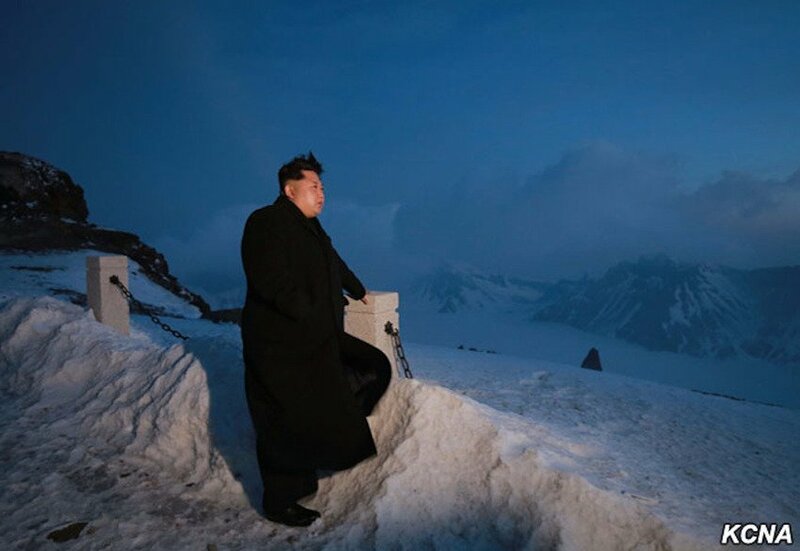 “Climbing Mount Paektu provides precious mental pabulum more powerful than any kind of nuclear weapon,” the Rodong newspaper quoted Kim Jong-un as saying to troops. The purpose of the visit is said to have been to see pilots from the Korean People’s Army who have completed a tour of battle sites in the area. The Oxford English Dictionary defines “pabulum” as “bland or insipid intellectual matter, entertainment”. It is also part of the propaganda which glorifies the Kim family, who are said to have a “mount Paektu bloodline”. Recently it has been claimed that Kim Jong-un could drive by the time he was three years old. Like his father before him, Kim Jong-un makes many “field guidance trips” to army bases, factories and other important sites.